My little boy loves Bob the builder so when an opportunity to review the latest dvd arrived, we jumped at it! Blake is 27 months and doesn't quite sit through the full 60 min feature but that suits us fine, the story is broken down into sections so it is easy for us to stop the dvd and have a chat about what we have seen and then go back to it. Bob and his team are building a theme park for Mr Tobleronie (Yep, the name makes me want triangle shaped chocolate!) but when they are preping the site, they discover dinosaur bones! As the story progresses, a number of the main characters discover dinosaurs and these discoveries are used in the theme park, but what I really liked was that they had a book of dinosaurs and with each discovery also came a little educational bit about the dinosaur. For us, we paused the cartoon after each discovery and recreated some of the story - we like to pretend to be Rubble the new character and when the team found a terradactyl we flew around the room and pretended to catch fish! The story flows well if your little one has a longer attention span than mine! the cartoon is well animated with lots of lovely bright colours and none of the story was frightening for my 2 year old so a good thumbs up. There's only one short fireman sam advert first so you don't have to get in a panic - thank you! - or is it just me thats put a dvd on only to discover the adverts before the cartoon are too long and either toddler is distracted before the cartoon starts or having a full on tantrum freak out! The dvd has a bonus feature which is a lovely selection of 6 worksheets to print out from your computer, including a make your own paper bob hat. 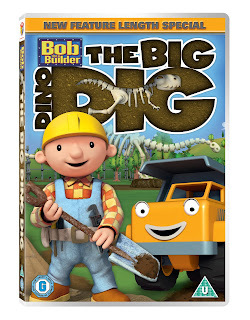 I have a copy of Bob the Builder Big Dino Dig for one of my lovely readers to win, to enter, please share a dinosaur or bob the builder story in the comment box below. Competition open to UK people only, and the winner will be sent their dvd directly from the PR company. For extra entries you can Tweet a link to this post (please include @beachpebble and @bobthebuilderuk) or like my facebook page. Please add a separate comment for each entry below so I can include all your chances in the draw. Competition closes 29th September at 8pm. Thank you for entering Sarah! my little boy loves dinosaur's, especially as his fave character George from Peppa Pig loves them! He likes to make dinosaur noises - so cute!